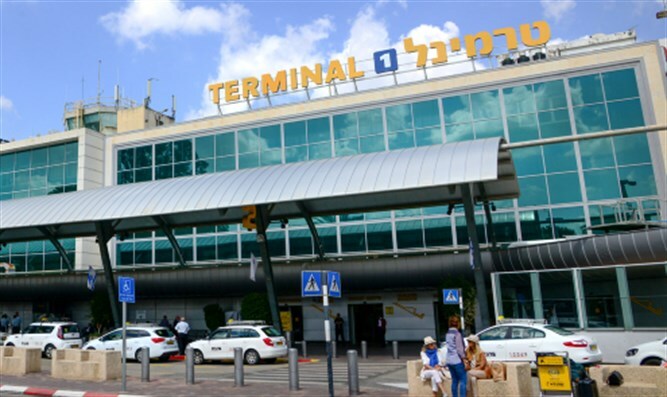 Israel's oldest terminal gets a revamp, Airport Authority head says results of 'open skies' agreements are exceeding expectations. Ben Gurion International Airport's new Terminal 1 was inaugurated on Tuesday, allowing low-cost international airlines to begin using it. The terminal was closed in January for renovations, and reopened in May, and 1.4 million passengers per year are expected to depart the terminal. Included in the renovations are a new hold baggage security screening system similar to Terminal 3's, an extended luggage checking area, biometric passport stands, nine exit gates, and a renovated "duty free" area. In addition, Terminal 1 - the original terminal - has been redesigned in a modern style, with statues of former Prime Ministers Menachem Begin and David Ben Gurion. The new "duty free" area will contain chain stores and private stores, selling tobacco, alcohol, cosmetics, perfumes, electronics, books, gifts, fashion, cell phones, electrical appliances, and the airport's only Foot Locker store. Check-in security for the expected 33 flights each day will now take place in Terminal 1 instead of Terminal 3, but landings will still take place at Terminal 3. Airlines operating out of Terminal 1 will pay half the parking fees of those operating out of Terminal 3. Included in these airlines are: Arkia Airlines, Blue Bird Airways, easyJet, EL AL, Israir Airlines, Pegasus, Ryanair, Wizz Air, and more. Later this year, the Airport Authority is expected to open a fourth section in Terminal 3. The new 17,000 square meter building will include 8 boarding gates. In addition, a new airport is expected to open near Eilat, replacing the airport currently in the city's center and allowing Eilat to grow. It will be the first international airport built in Israel since 1948. "The open skies policy is a situation that is not merely increasing duty-free sales (which pay for a large proportion of infrastructure construction)," Israel Airports Authority Director General Yaakov Ganot said. "We have reached a situation a situation in which we have to reject requests from airlines because we lack time slots for them." "The decision to renovate Terminal 1 follows an uncomfortable period in which we were all busy with Timna Airport and the building the fourth wing at Terminal 3. For lack of choice, we decided to go ahead." "When I became minister of transport in 2009, there were nine million passengers, and now we're talking about 20 million passengers in 2018. The results of open skies have exceeded the forecasts," Transportation Minister Yisrael Katz (Likud) said.The Israel Airport Authority also noted that they are planning to build an international airport in Israel's north, to support the industry's expected expansion. The expected cost of all three projects - Terminal 1, Terminal 3, and Eilat's new airport - is expected to top 2.5 billion NIS.